I’ve always loved this quote because it’s so true and it strikes at the heart of entrepreneurialism. I believe that I can change the world, little by little, and so can you! It takes patience, though. Great things don’t happen overnight. 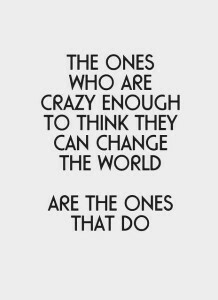 However, if you are crazy enough to believe that you are change the world, go for it. The world is full of complacent, bland people living lives that are just that. If you strive for a life that’s extraordinary, you’re definitely stand out among the crowd!